P. 118 - Icon Front Seat POV and Rider Cam! Turns out they went for a midnight announcement. This is from their official youtube. Blackpool Pleasure Beach has announced it is to build a new £16.25m rollercoaster. It will be the UK’s first ever with a double-launch – an advanced technology that gives the roller coaster two powerful thrusts of acceleration during the ride. ‘Construction 2018’ will feature the most number of interactions in the world with 15 interactions involving five different rides and two tunnels. The ride is being manufactured by Mack Rides at their world-class factory in Waldkirch, Germany, utilising the latest state-of-the-art engineering processes, including laser beam technology for extreme accuracy. The ride will open in Spring 2018. A double launch will see thrill seekers propelled forward at high speed not only at the start of the ride, but also at a second point half way through the two and a half minute experience. Riders will experience the same levels of G force as felt by the driver of a Formula 1 car. The launch of the ride features acceleration which is 4 times that experienced in a Lamborghini Gallardo. Construction 2018 will reach heights of 88.5ft with drops of up to 82ft. It will interact with five other Blackpool Pleasure Beach rides including the iconic Big One, Steeplechase, Big Dipper, Pleasure Beach Express and the Grand Prix. Over 44,800 hours have been invested in the development to date with that number expected to treble ahead of completion. Speaking on the announcement Deputy Managing Director of Blackpool Pleasure Beach, Nick Thompson, comments: “We have been working on this concept for five years now and are delighted to be able share news of our plans. Construction 2018 brings together the Thompson and Mack families, owners of Blackpool Pleasure Beach and leading manufacturer of amusement park attractions, Mack Factory respectively. 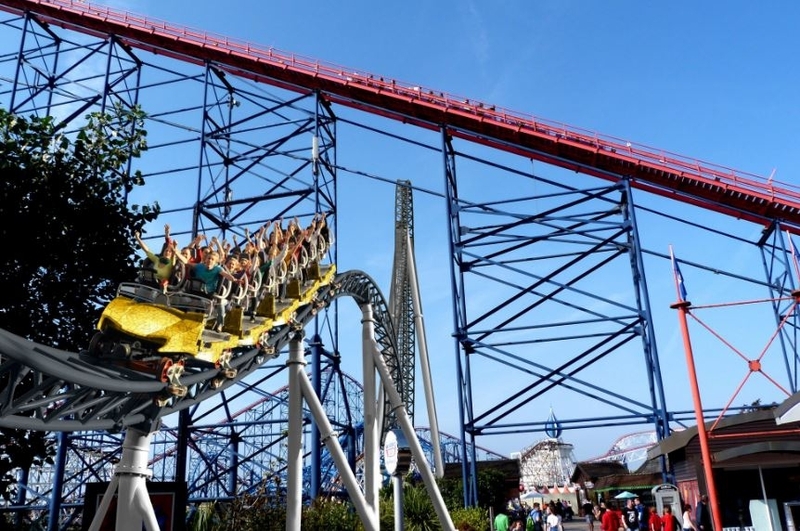 The development is the biggest of its kind in recent years and cements Blackpool Pleasure Beach’s position as one of the UK’s leading amusement parks. Last edited by jedimaster1227 on Mon Oct 03, 2016 8:54 am. Nice layout, the second half is definitely more intense then the first half and I love that little outward airtime hill towards the end. gerstlaueringvar wrote: Nice layout, the second half is definitely more intense then the first half and I love that little outward airtime hill towards the end. Agreed. That second launch looks crazy. chickenbowl wrote: ^ I was making a joke. You probably should leave the comedy to the professionals. Sure, dude, I thought after 10 years of posting here I knew the crowd... Sorry for upsetting you that much. ^^ but on a serious note, this coaster looks great. And I'll agree about that second launch, too! That looks fantastic! I think the slalom bit at the end could've used a zero-G like on Helix to cap the whole thing off, but this has real potential to be the best ride at Blackpool (not counting the Wild Mouse). That color scheme could use some work, though...Construction 2018 kind of looks like Nickelodeon: The Ride. This looks like a great addition to the park. See y'all later. I'm too busy planning my vacation to England.